From a weather perspective it's certainly turning out to be a 'typically' British one! Reading the Met Office weather blog it also appears to have been a particularly windy one too and a lack of high pressure seems to be to blame! Saturdays deluge certainly lived up to expectations, with more Atlantic fronts to come and seasonally cool temperatures to continue in the short-term. 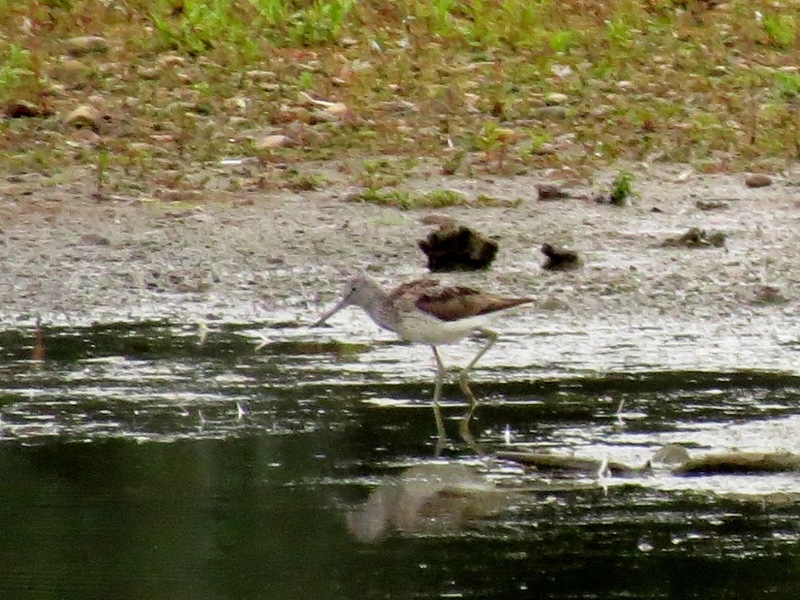 Record shot of Greenshank on East Marsh Pool, Brandon Marsh! 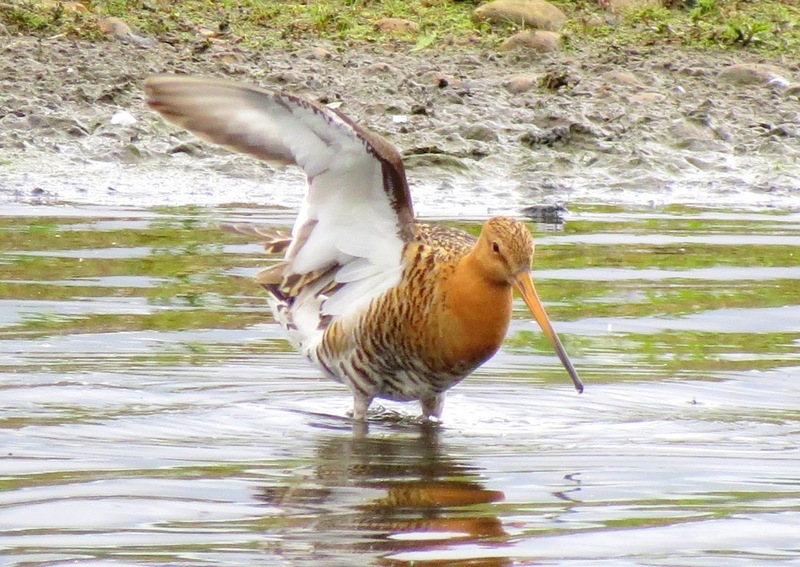 However, there are always benefits to be had and waders appear to be on the move. 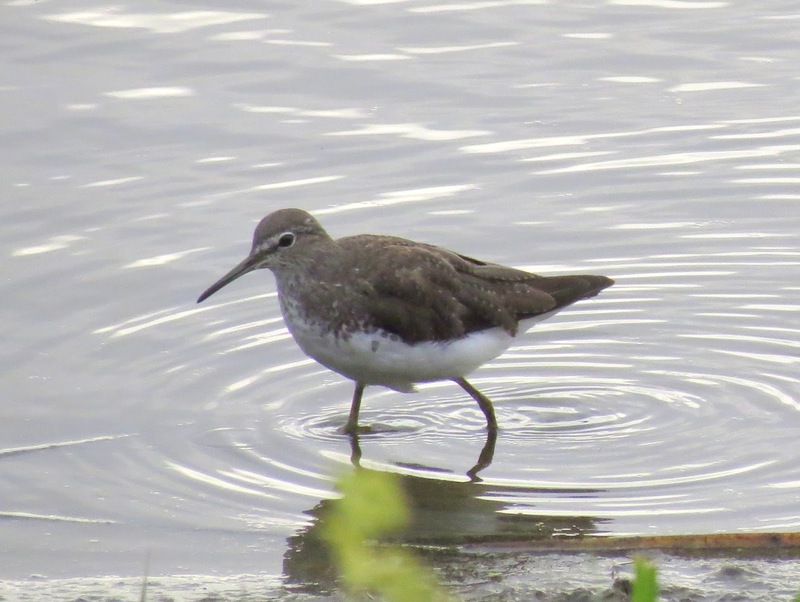 Last Sunday (19th) for example a Greenshank dropped into Brandon Marsh briefly and a total of four Green Sandpipers are currently to be found on site. 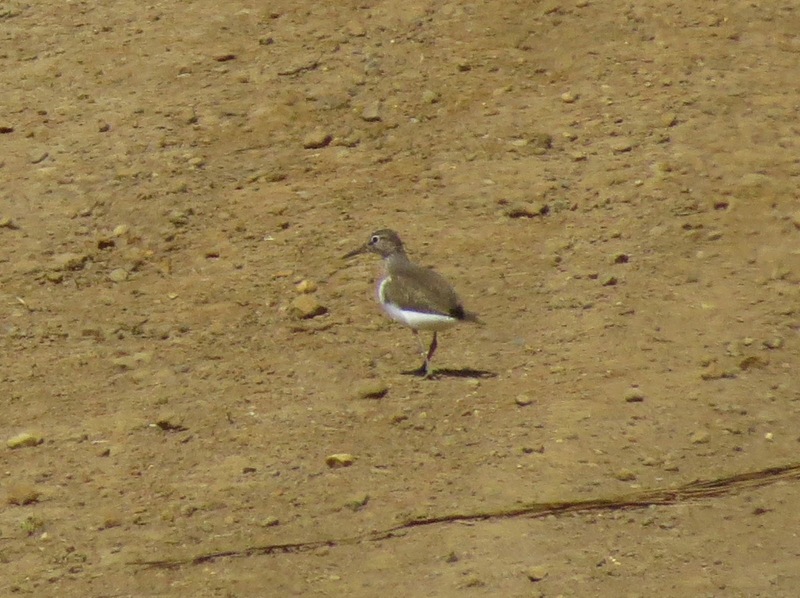 Little-ringed Plovers drop in now and again and a single Dunlin was recorded on my regular Tuesday visit (21st). Also of note a Grasshopper Warbler was reeling over towards the golf course from Alban's bench! Closer to home a stroll around the marina grounds the following evening just before sunset yielded a Whimbrel calling in the vicinity, but unfortunately I failed to connect and the bird seemed to continue on. 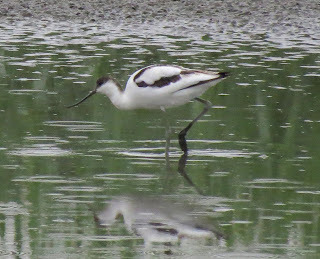 A visit to Brandon Marsh yesterday in the pouring rain produced an Avocet, first seen by Bob Lee and remained on Teal Pool well into the afternoon. 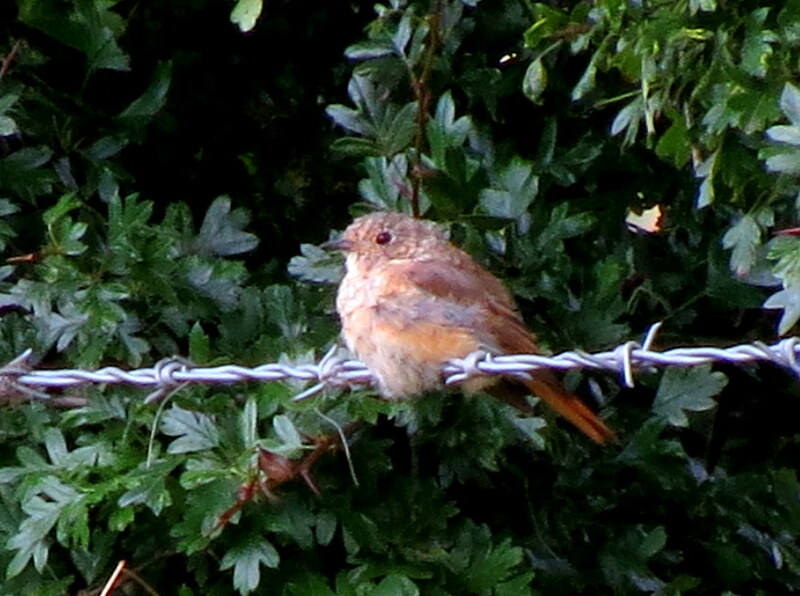 Juvenile Redstart at Napton - Yet another record shot but all good stuff! Finally there's movement at Napton-on-the-Hill and Spotted Flycatchers have arrived, or fledged close by in small numbers, with at least a half dozen to be found in the paddocks. Another recent find, a Common Redstart, was showing quite well in the late morning sunshine and while visiting it was great to see no less than seven Mistle Thrush come through! 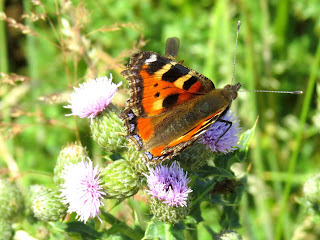 A day out around the local area starting off by accompanying Jim Timms on one of his butterfly transects. Although the day started off a little overcast there was plenty of warm sunshine to be had and many Butterflies and Odanata on the wing. Silver-washed Fritillary - Plenty on offer but would they land!! One of the highlights had to be at least four Purple Emperors, including a couple of males, which we managed to get some half decent scoped views of at treetop level. 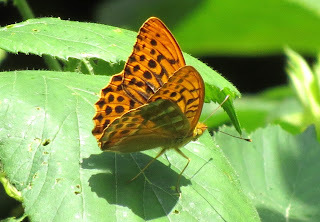 Silver-washed Fritillary were also quite numerous but trying to get any decent images proved a little harder. White Admiral - Another brief photo opportunity. White Admirals were also in decent numbers, along with Small Skipper, Ringlet & Meadow Brown. Smaller numbers of Large White, Green-veined White, Speckled Wood & Marbled White were also noted. 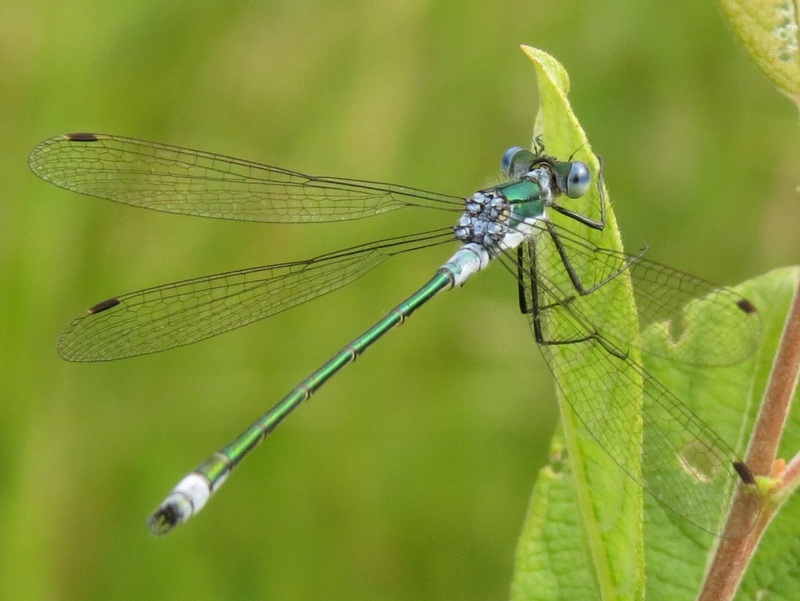 Emerald Damselflies - Double figures during the transect! 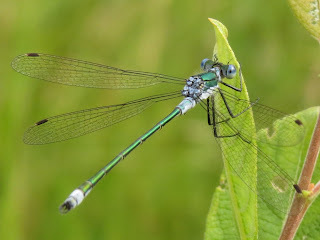 A good selection of Dragonfly and Damselfly, the latter producing many numbers of Common & Azure, but my favourite had to be Emerald Damselfly, over twenty seen today! 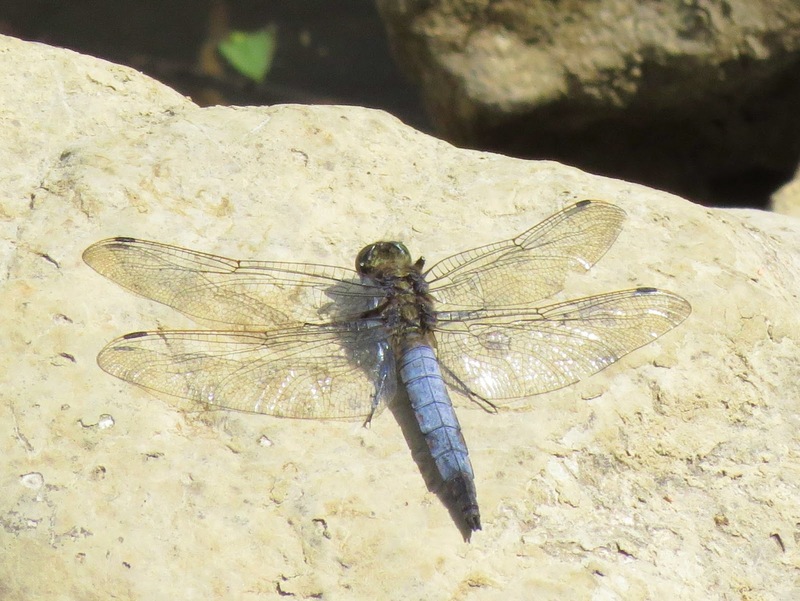 Four-spotted Chaser, Ruddy & Common Darter, Emperor, Black-tailed Skimmer & Brown Hawker also noted. 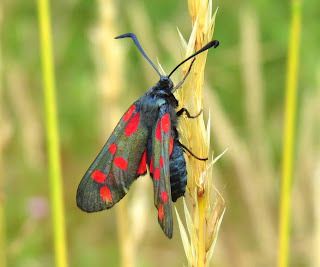 Six-spot Burnet Moth - One of a half dozen today. At least a half dozen Six-spot Burnet Moth and the large pools which the transect encircles had a lone Black-tailed Godwit, which Jim tells me is a first in 8 years. However, as he pointed out most of the time he's looking towards the ground! Another birding highlight was a Red Kite, which drifted over Cubbington, a really enjoyable day out! Moored back out on the 'cut' once more and Dee and I have spent a lot of time cycling the towpath and back lanes of Warwickshire and Northamptonshire, in particular some of the Unclassified County Roads, or 'E' Roads. A real diversity of habitat with rolling meadows, hedgerow and even at this time of year the bounty of a newly ploughed field, although having said that I've yet to spot anything noteworthy! Although Hare's, Red-legged Partridge, Common Buzzard, Skylarks and many Corvids are always a pleasure to watch. Redundant St. Peters at Wolfhampcote, a National Heritage site. Swifts have been a feature while sitting sky-watching at the mooring, with a constant passage, including a group of around 50+ passing through late evening yesterday. A Tern Sp. caught the eye flying at speed across the adjacent fields, turning out to be a common but the ground it covered in such a short time was amazing. Bats continue to enthrall us at dusk and a plop in the water which got us excited turned out to be a Brown Rat! Haven't seen a Water Vole along this stretch in a few years now! Ashby Canal is the place for these. 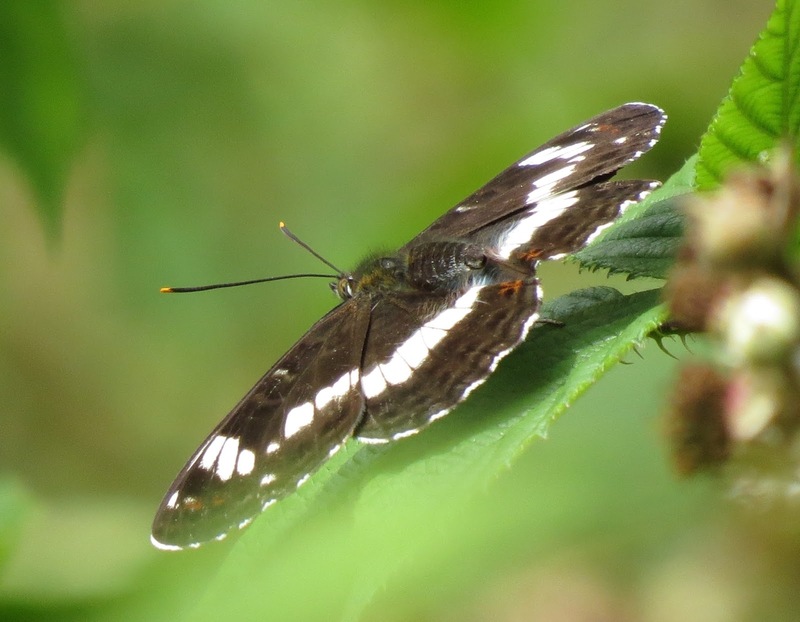 White Admiral - A towpath first! A first for me on the towpath on Friday was the above White Admiral, which took the eye as I cycled past a small copse. Small Tortoiseshell, Meadow Browns, Ringlets and increasing numbers of Gatekeepers, along with Large Skippers and the occasional Speckled Wood and Comma are the most abundant butterflies. Finally one or two Common Darter dragonflies are beginning to appear and a Black-tailed Skimmer was noted. 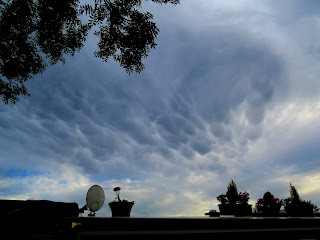 Eerie Mammatus clouds over Warwickshire! On Friday evening some amazing formations of Mammatus clouds over our mooring. Composed primarily of ice, these cloud pouches can extend hundreds of miles in any direction, remaining visible in the sky for perhaps 10 or 15 minutes at a time. 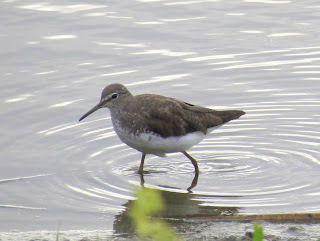 After coming back into port (the marina) for a few days I managed to grab several hours at Brandon Marsh today in the good company of Alan Boddington and a very knowledgeable Dave Mount! 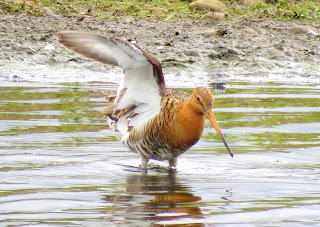 Shortly after parking up I bumped into Bob Duckhouse and we both headed off to East Marsh Hide to check out a Black-tailed Godwit. 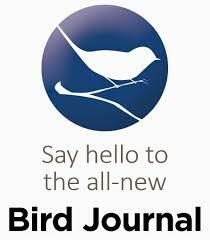 Probably the same bird that Fred Stokes had texted me about on Sunday morning. After locating the bird it was obvious that some better photographic opportunities were possible from the Wright Hide, so off we went. 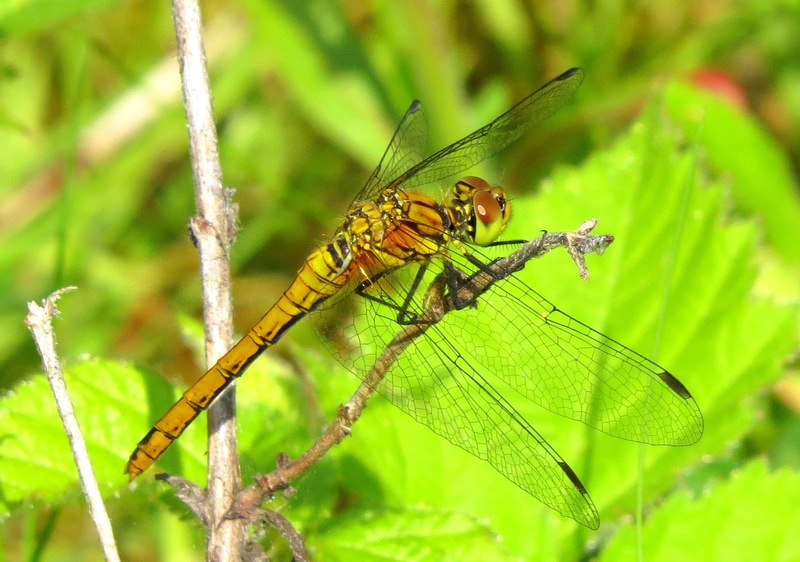 Newly emerged Ruddy Darter! I first tweeted this as a Common, Thanks to Paul Cashmore for the ID correction! After lunch Alan, Dave and I decided to head off around the reserve on a butterfly and dragonfly quest and after checking out various pools, with Red-eyed and Blue-tailed Damselflies on Goose pool our first Dragonfly appeared, Ruddy Darter. 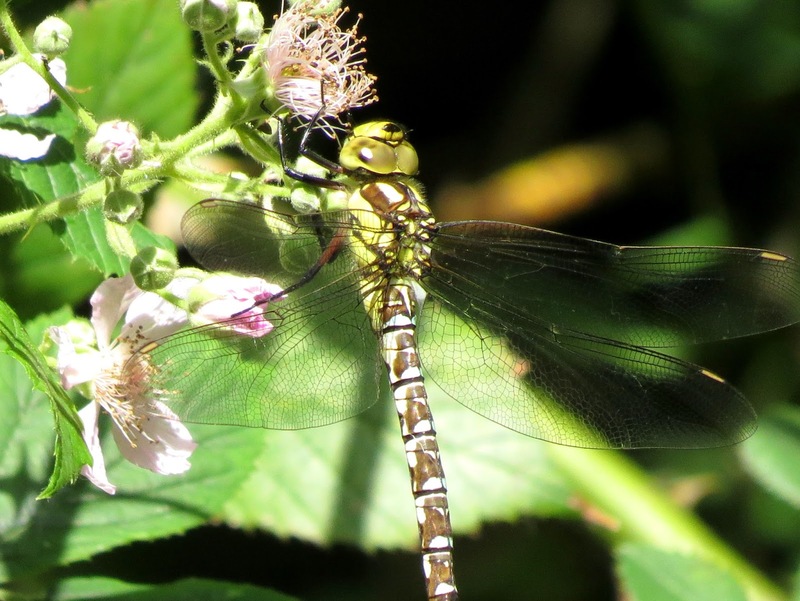 As we passed through Old Hare Covert towards River Meadow a small Grass Snake cut across the path then two more dragonflies took the eye, Southern Hawker, one of which was duly photographed. We inadvertently flushed an Emperor Dragonfly a short time after which tantalised us for a short while before heading off and the hay meadow itself was awash with Ringlet & Meadow Brown Butterflies. The river held small numbers of Banded Demoiselle, plus a tiny little chap hunkered down in the meadow sweet, which judging by the nearby parent was most likely a newly fledged Blackcap. 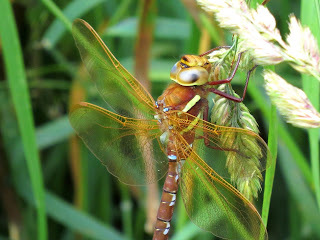 Brown Hawker - My nemesis! To end the day I was quite happy to manage a photograph of one of my nemesis dragonflies when we came across the above Brown Hawker, which actually landed! 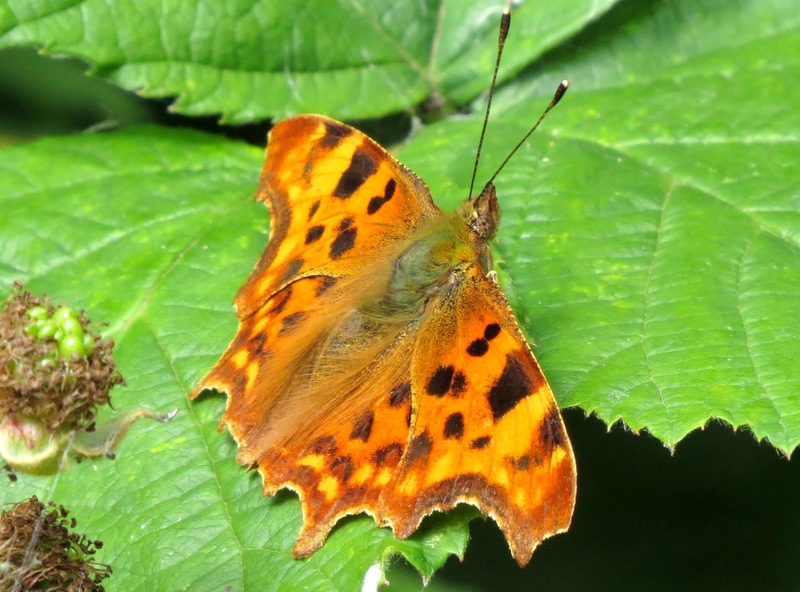 Comma - One of a number of other species encountered today! 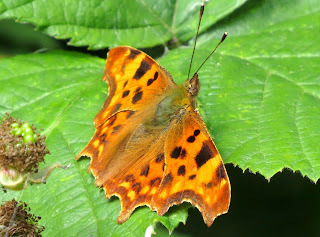 Other species of note today included: Comma (7), Small White (3), Red Admiral (3), Small Tortoiseshell (5), Large Skipper (11) and Speckled Wood (1), plus Black-tailed Skimmer Dragonfly (4). 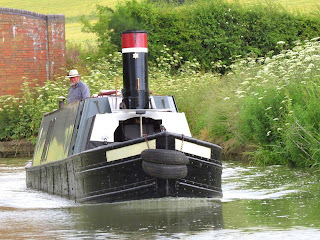 It's great to be back on the 'cut' after what seems an age and since Thursday we've been moored at one of our favourite spots on the Oxford Canal near Wolfhampcote. 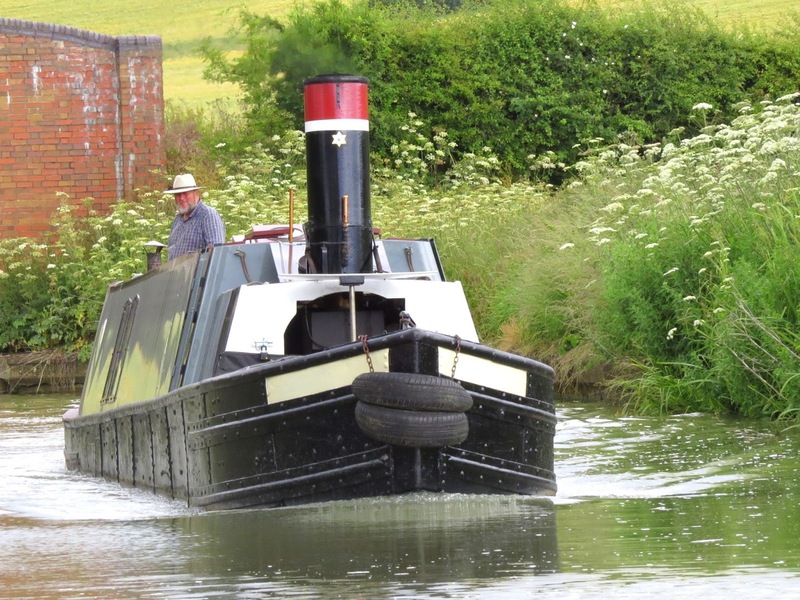 Narrowboat Adamant passing by - A working example of a Steam Canal Tug! A pleasant cruise down along this stretch which passes through open countryside with a backdrop of hills. The land is agricultural, with just a few houses in sight. There are initially no locks, no villages and the bridges are well spaced, making it a very pleasant rural stretch of canal. There's also a good section of the disused LNWR railway line to explore, a section of which ran from Marton Junction to Weedon and finally closed to passenger traffic in 1963. Yellowhammers - No shortage here of this 'Red Status' species! 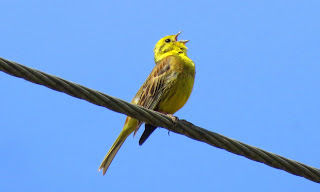 Yellowhammers are constantly singing and the usual farmland species can be found like Linnet and Skylark. 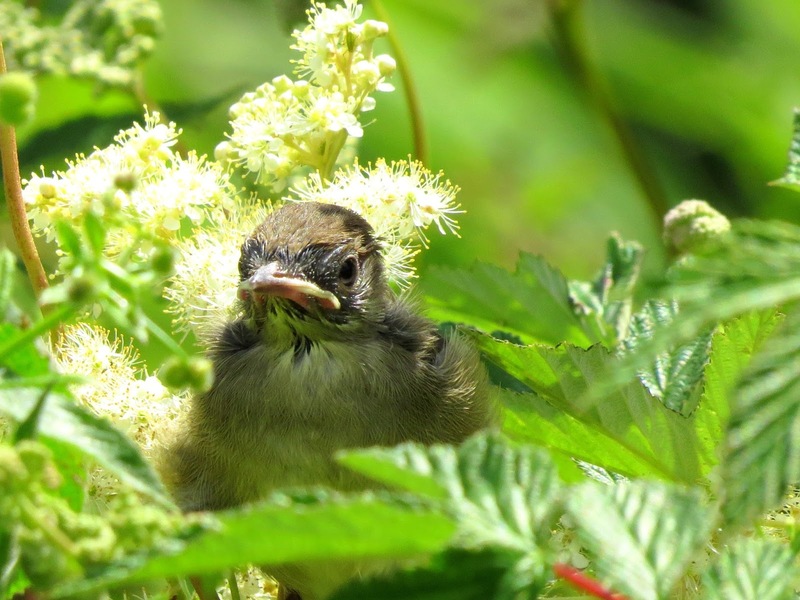 Opposite the towpath side Sedge Warbler, Common Whitethroat and the occasional Lesser Whitethroat can be found in the vegetation. 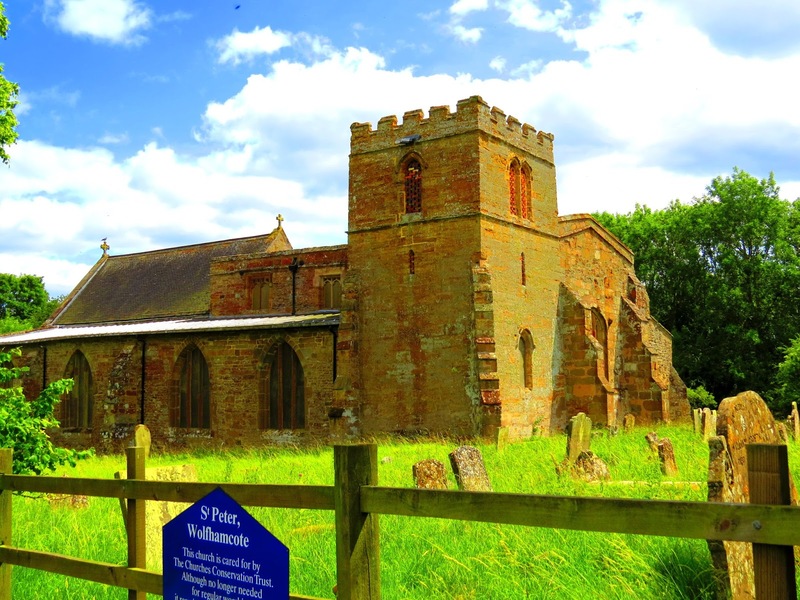 I've completed a few towpath walks along towards Braunston and cycled around Flecknoe, Wolfhampcote and Sawbridge, constantly on the lookout and listening in the hope of picking up Quail and Turtle Dove, the latter of which I've managed here most years. 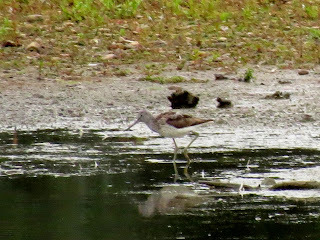 A disappointing attempt at one of the Common Sandpipers! Red-legged Partridge and several Hare's on my travels but my yearly local Grey Partridge has thus far eluded me. Common Terns have been drifting by daily along with several Raven and a local Barn Owl has been quartering the fields opposite our mooring. 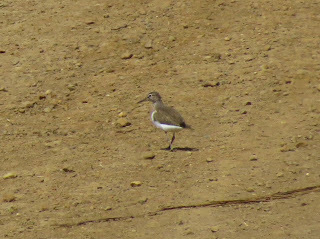 On Friday three Common Sandpipers appeared along the towpath and spent the afternoon close by, with me in tow looking for a decent photo. We watched them head off shortly after sunset, circling a number of times before departing, visible migration in action! Remarkably there's been a complete shortage of Dragonflies in the area but plenty of Azure, Common Blue and Banded Demoiselle damselflies, along with the odd Blue-tailed. Strangely I have also encountered a Beautiful Demoiselle, a species which normally enjoys fast running water. Butterflies have been numerous with Ringlet and Meadow Brown the most abundant but Speckled Wood, Large, Small and Green-veined White have all been noted, along with Large Skipper, Red Admiral and Small Tortoiseshell. 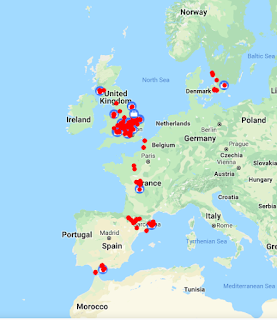 Dee has been out with her bat detector and by using recordings taken from the Bat Conservation Trust has identified Common Pipistrelle, Soprano Pipistrelle and Daubenton's. 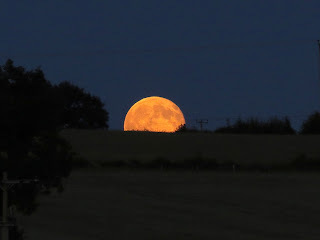 Other highlights thus far: A fantastic moon-rise on Thursday evening and an equally spectacular thunderstorm on Friday night, a bit disconcerting being moored up quite close to a large tree in a metal boat during one of these! Another surprise, a bold knock on the door on Saturday morning found Richard Mays and Dave Cox come to visit and it was nice to have a good catch up over a tea and coffee.